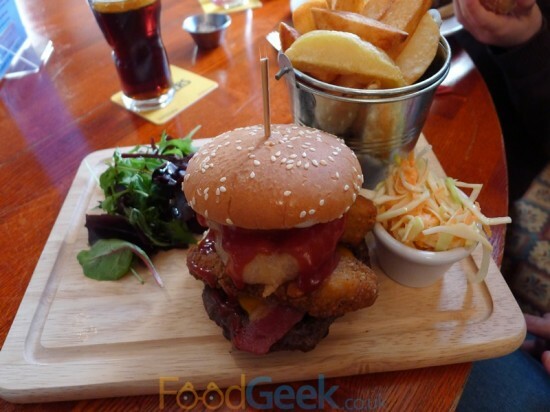 It’s no secret that i’m quite partial to a burger, well good ones anyway. 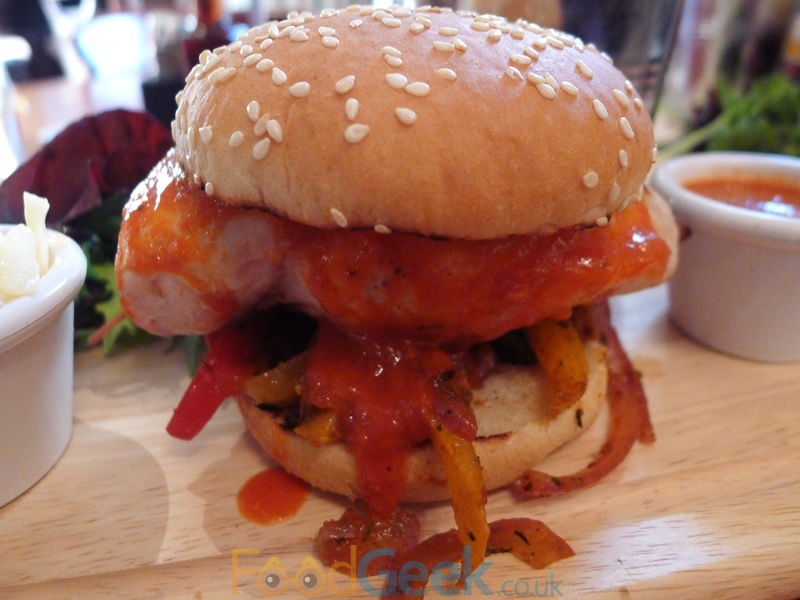 I’ve eaten many this year but one of my favourites is the ‘Peri Peri Chicken Topped Cheeseburger’ from my last visit to The Farmers Arms in Bolton. Since then they’ve launched a full burger menu with some fine looking creations which i’d been looking forward to trying. Whilst chatting to owner/chef Jon Jones one Saturday morning he mentioned a new ‘Hot’ burger he was working on. Knowing my fondness for all things spicy he asked if i’d like to road test it for him. Needless to say I did and a couple of hours later I was sitting down in the Farmers Arms. 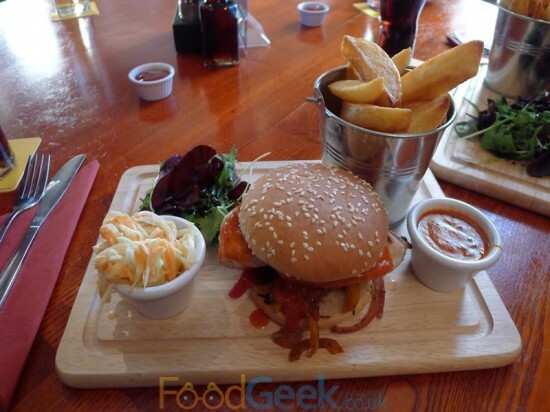 There’s far more than just burgers on offer though and as usual the more interesting dishes are on the specials board. This time I went for ‘Teriyaki Glazed Chicken Wings’ which were excellent. 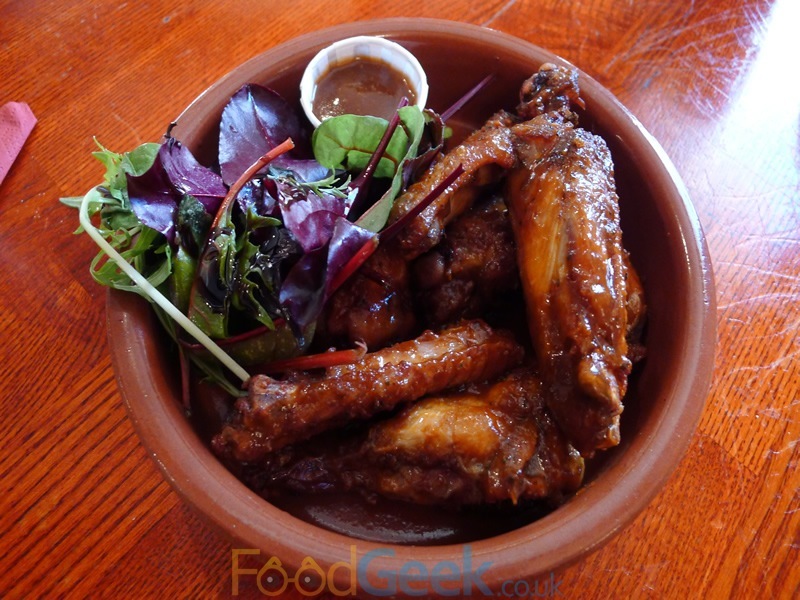 Sticky, juicy wings with a savoury umami yet slightly sweet sauce were delicious and very moreish. 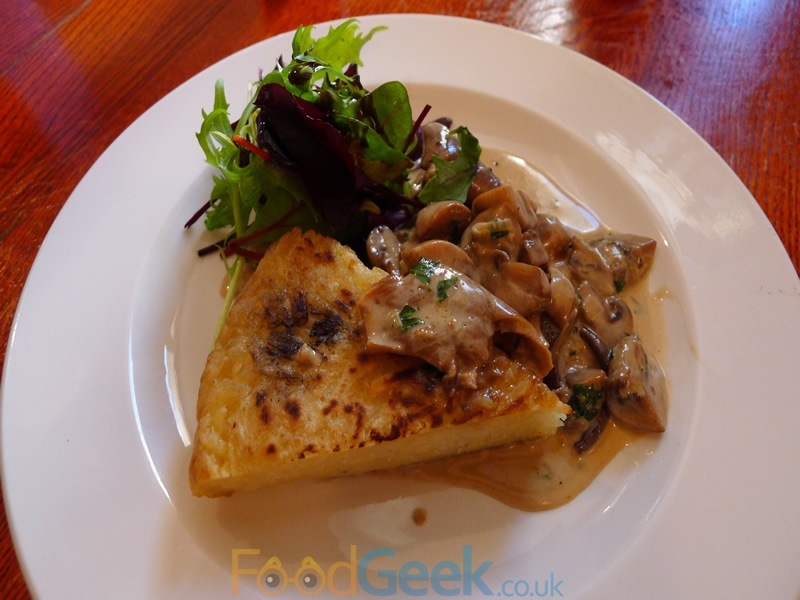 Mrs FG also ordered from the specials board, a ‘Potato Rosti & Wild Mushrooms’. Not quite my definition of a rosti to be honest, it felt more like a giant potato cake but whatever it should be called it was good. Combined with creamy wild mushrooms it was a lovely warm and comforting dish. When my ‘Hot As Cluck Burger’ arrived I was surprised it didn’t contain a regular beef patty, it’s purely a chicken burger. I guess the clue’s in the name but I was expecting the chicken to be on top like the Peri Peri chicken last time. Though it is a whole chicken breast, a good sized one too so it’s still a pretty substantial burger. After the warnings i’d received I approached it fairly cautiously but I needn’t have. I’m not going to lie and say it isn’t hot as it definitely is, I know many people wouldn’t be able to finish it but for chilli heads like me it was the perfect heat. Just about hot enough to make it slightly uncomfortable but not too much to make it unbearable. The sauce is hot, it’s made with scotch bonnet and naga chillies as well as my all time favourite condiment Sriracha but it tastes good and the flavour of the onions and peppers still comes through. Overall I really enjoyed it but would prefer a beef patty on there as well. I believe there is an option to add one for £1 which i’ll definitely do next time. I liked the sauce so much that I was using the extra pot on the side to dunk my chips in, much to the amazement of the watching staff. I was always going to try Mrs FGs burger but as she’s a girl not as greedy as me I luckily ended up eating almost half of it. She went for ‘The Steeplejack’, named as a tribute to Bolton legend Fred Dibnah. 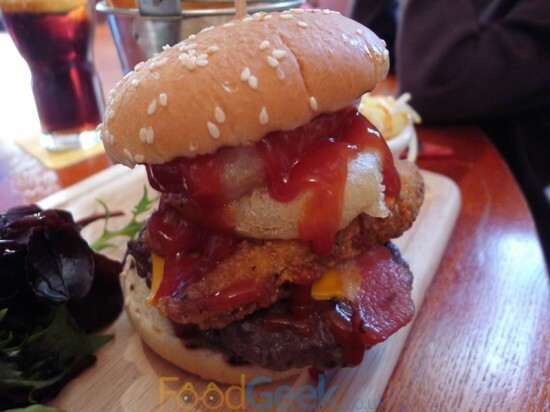 The thick 1/4 patty was cooked medium rare as it should be and topped with crispy Southern fried chicken, onion rings and bacon. I’ve got to say that although I loved the heat & taste of my burger this was far better overall. It’s the perfect combination of juicy, meaty, crispy, crunchy and tasty. The bacon in particular had an amazing strong, smokey flavour, I asked Jon about it later and he told me it’s cooked slowly in the oven to make it extra crispy and intensify the flavour. The thing I look forward to the most about visiting The Farmers Arms are the desserts, we’ve had some fabulous puds here and this time was no exception. 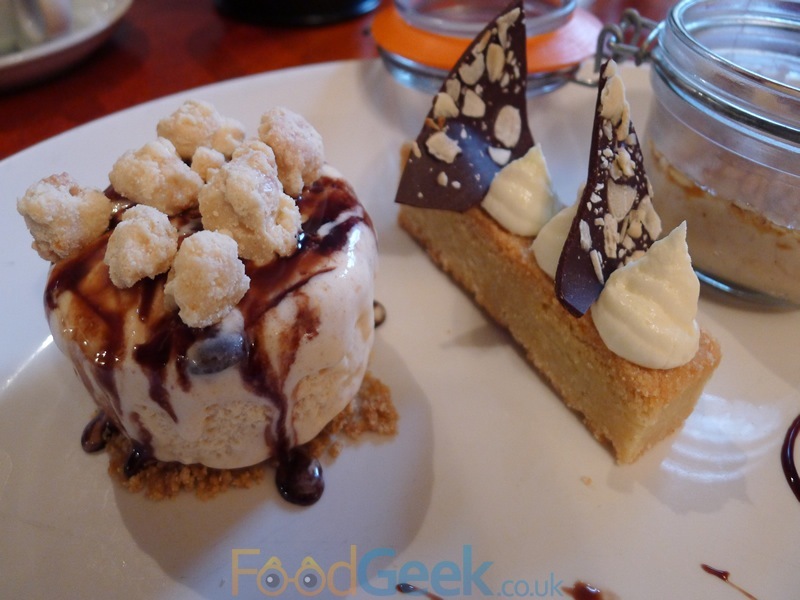 We ordered a sharing platter featuring three current popular desserts. 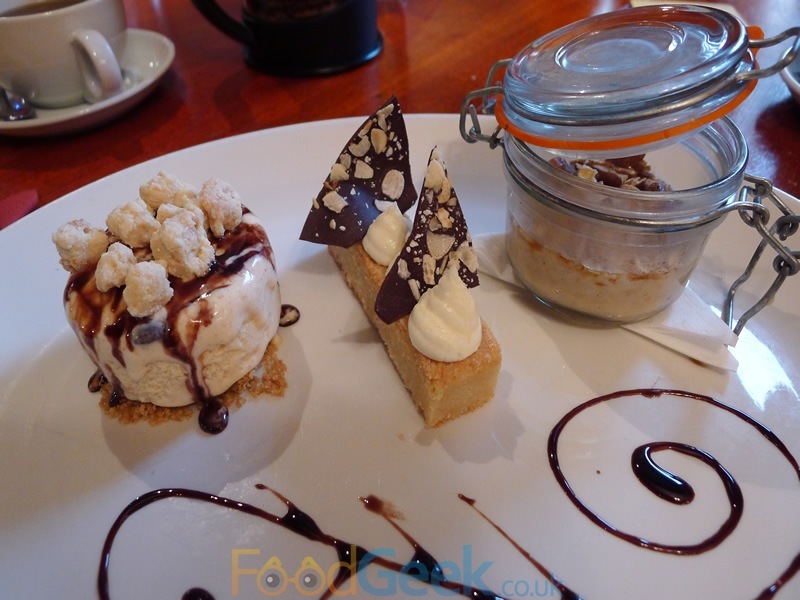 ‘Vanilla Rice Pudding, Granola and Golden Syrup’, ‘Snickers Parfait’ & ‘Lemon Shortbread’. The rice pudding, served in a glass jar was wonderfully comforting, perfect for this time of year. 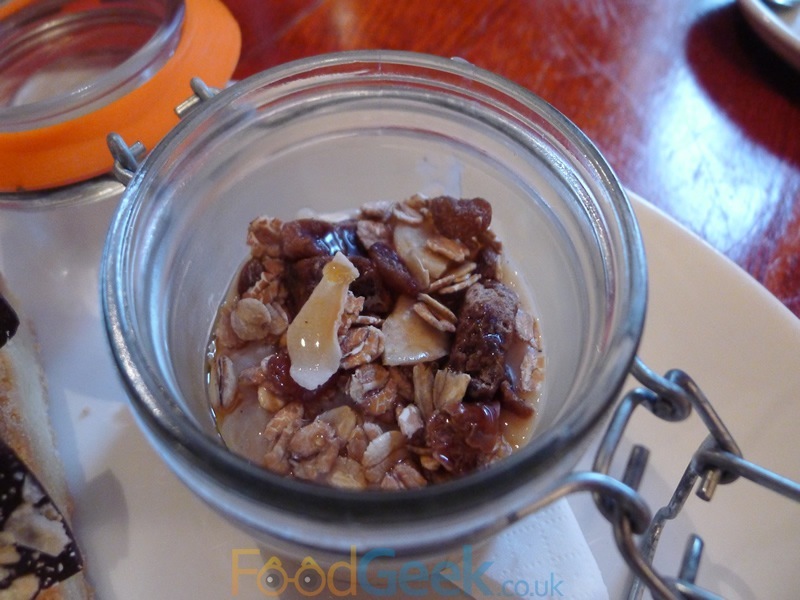 It’s amazing how the addition of a bit of vanilla and decent granola can elevate such a humble and homely dish into one worthy of being served in a restaurant. It really did taste good, my only complaint is that the portion size is a little small for a dish intended for sharing. Or maybe i’I’m just greedy? The other two elements were also great. A beautifully soft, buttery and crumbly shortbread topped with thick lemon cream and chocolate was a joy to eat but the star of the show was by far the ‘Snickers Parfait’. Jon clearly loves Snickers as much as I do as they’ve made there way into a dessert here before, the brilliant ‘Snickers Crème Brûlée’ which I loved. I think this was even better though. Rich and creamy with the distinctive flavour of Snickers running through it, topped with almond chocolate sauce and white chocolate crumble. We left The Farmers Arms very full and happy after another great feed. The standard of food remains high and I love that even though the regular menu is already pretty good every time I go I’m tempted by exciting specials. I’m also confident that these are the best burgers in Bolton by a long distance and I’m looking forward to trying the others. Not on my next visit though, that will be to get me in the Christmas spirit as the Festive Set Menu looks particularly good, Egg Nogg Pannacotta with Mince Pie Ice Cream anybody? Not sure I’m ready to try this place again. I’d heard good things and was aware of Mr Jones’s provenance but I found the service very lacking. When I asked if I could have my burger “quite rare”, I was met with a look of horror (from an American who I mistakenly assumed should know better) and was told that as the burgers are made from minced beef (glad she cleared that up at least), it would have to be cooked well done (and it was). Hi, sorry to hear that. Obviously I can’t speak for the restaurant. All I can say is this was my 4th or 5th time and the food has always been exceptionally high standard. For me the service doesn’t quite match it but only in terms of speed and efficiency, i’ve never had any specific issues like you mention. I just remind myself that it’s a pub in Bolton and not a restaurant. I’ve never asked or been asked how i’d like a burger cooked but it’s always been medium rare to medium at most. Finally, I do know that the American you’re talking about was the bar manager but has now left and been replaced. Hopefully you’ll give them another chance someday, thanks for your comment anyway! I can only agree with The Food Geek, the burgers at Farmers Arms are second to none in Bolton and the rest of the menu, with all its character, has brought a fresh option to eating out in the town. I live close to Farmers Arms and have seen the string of disappointing attempts made at making this pub work, only sinking into deeper into a tainted existence. It is obvious that Jon and his team have a mammoth task of winching The Farmers Arms back onto the pedestal it deserves and up to now are doing a good job of it. I look forward to seeing the work done at the pub in January and don’t really know where to go whilst they are closed. I for one raise a glass to The Farmers Arms and all the staff.